American made flexible cheerleading mats for cheer, free exercise mats for tumbling and gymnastics, carpet flexible-mat rolls. 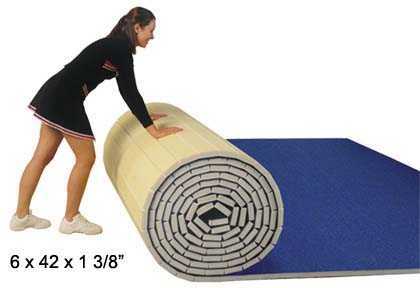 Flexible Cheerleading Mats are carpeted with 1-3/8" and 2" thickness options. Flexi-Connect™ is an options for cheer mats and wrestling mats. 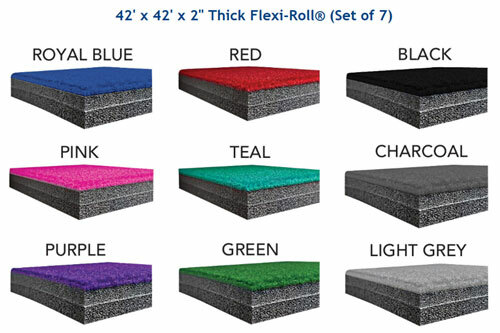 Our Roll able Cheer Floors are manufactured in 6ft. 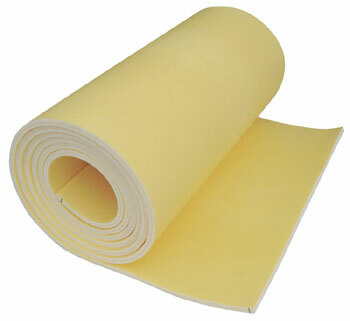 wide rolls with polyethylene closed-cell, cross-linked, polyethylene foam, thereby markedly increasing response, shock absorption, and resiliency. In addition, tests have shown our cross-linked design exhibits superior longevity under test variables that include repeated bending and compression. While other polyethylene foams may look or feel similar, our dynamic chemical composition and advanced design elements combine to create a product whose safety and durability is unmatched. Our needle punch commercial grade carpet exhibits quality-enhancing characteristics that once again separate us from the competition. Its durability and non-slip traction is a direct result of the 26 oz. material we have chosen. Not only is it the strongest used in the industry, but also its softness has a feel of velour. Its polyolefin fibers (pile, nap) will not become stringy and cannot be pulled out by Velcro, a problem common to "bargain" mats. Similar products may look the same, but don't become enamored by 10-14 oz. imitations - their lighter weight simply does not provide the quality, safety and performance your program participants will appreciate for many years to come. Superior Impact Resistance Foams used in a variety of applications must be able to withstand long-term, repeated impacts. The foam must be able to "take the impact", recover and "take additional repeated impacts". The application may have an expected useful life of 20 years or more, requiring the foam to withstand hundreds of thousands of impacts and retain its protective properties. During testing our foam withstands up to 250,000 repeated impacts at 60% compression. Tougher Abrasion Resistance Cross-Link foams have a tough abrasion-resistant skin surface. This tough skin surface is why Cross-Link foam is used in such camping pads. These pads are placed directly on the ground for the protection and comfort of military personnel. Even though the foam is closed cell; this not a water resistant mat. Lower Shrinkage In today's more demanding applications, the need for lower shrinkage foams is critical. Our Cross-Link cross-linked olefin foams have lower and more predictable shrinkage than comparable, competitive foams due to our consistently high level of cross-linking. The results of laboratory testing can be seen in the chart. They indicate improved thermal stability over competitive products. Go with a product that doesn't "shrink" away from your demanding applications. With nine color options be assured that your cheerleading squad color will be represented! 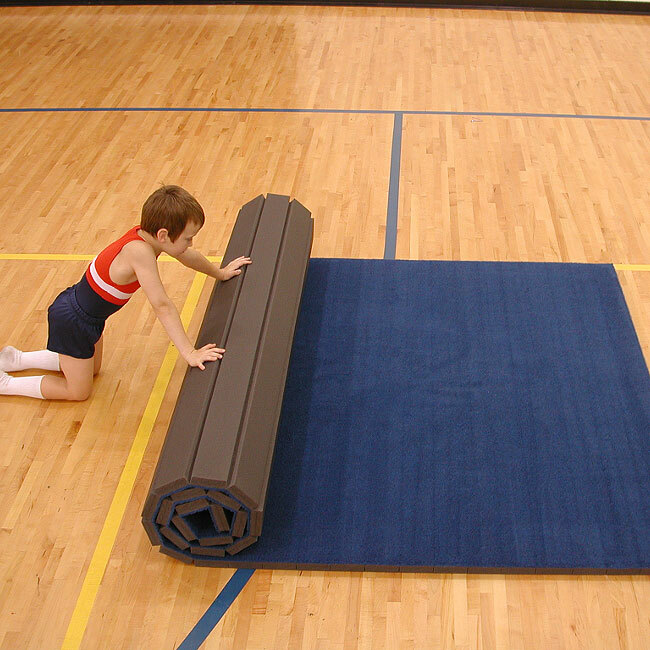 Our Flex-Cheerleading mats are so easy to roll out and roll up that even a cheer-boy can do it! 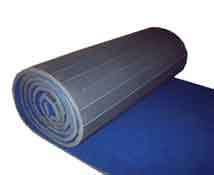 1 3/8" NON-Flexi Carpet Rolls $695 132 lbs. 6' x 42' x 1 3/8"
6' x 42' x 2"
Consists of 7 rolls of 6' x 42' x 1-3/8"
Total: 42 ' x 42' x 1 3/8"
Consists of 9 rolls of 6' x 42' x 1-3/8"
Total: 54 ' x 42' x 1 3/8"
Consists of 7 rolls of 6' x 42' x 2"
Total: 42 ' x 42' x 2"
Consists of 9 rolls of 6' x 42' x 2" Total: 54 ' x 42' x 2"
Foam only rolls are not covered with carpet or vinyl. These economical rolls must be covered/protected with a cover either carpet, vinyl or canvass. Buyer must determine the appropriate cover for the activity concerned. Vinyl, bare polyurethane foam, or non-carpeted mats are better suited for exercise mats for fitness. They'll provide more conform on the skin. Foam only rolls are made of cross-linked, polyethylene foam. Foam properties included quick rebound response, shock absorption, resiliency and are light weight. In addition, tests have shown our cross-linked design exhibits superior longevity under test variables that include repeated bending and compression. 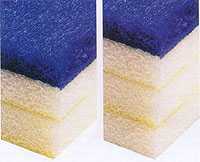 Polyethylene foam is less dense than rubber tiles, consequently is not recommended for weight room floors. 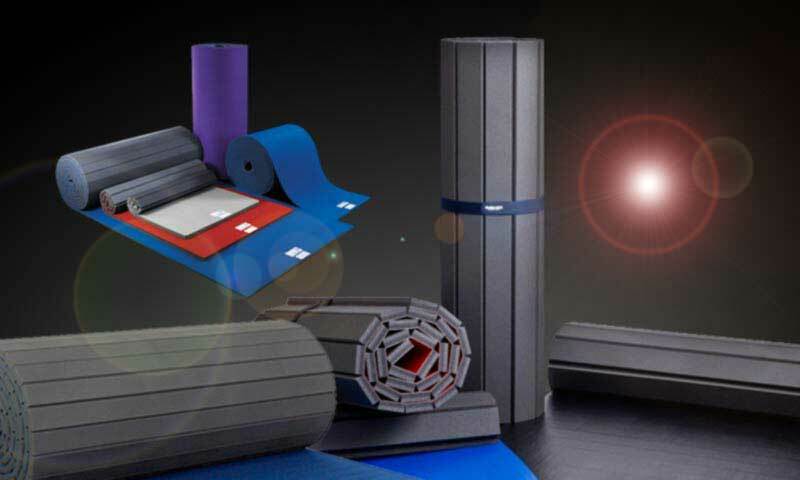 To acquire a seamless vinyl cover for the foam only rolls please visit seamless gym flooring. 6' X 42' X 2" polyethylene-Two-Layer 567 85 lbs. 6' x 42' x 1 3/8" polyethylene-two Layers 391 65 lbs. Note: Shipping is determined after you Add To Cart but before final submission of credit card information. 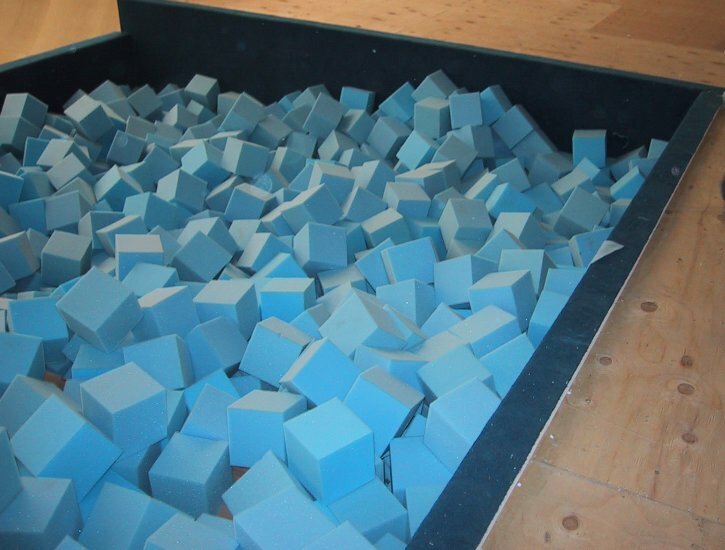 Completely fill or add new life to an existing foam block pit with 6" or 8" foam cubes. 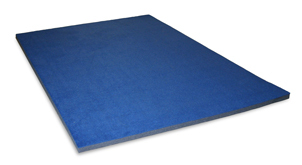 Our non-carpeted closed cell foam is used to produce free exercise mats, cheerleading flooring, fitness mats, MMA matting and standard folding gym mats. These rolls do not have electrical safety features.These are sold only by the 6' x 42 x 5/8"' rolls. Revolutionary manufacturing method produces a unique carpet cheerleading mat easily put down or rolled up by one person in minutes. No flipping required. Features the same top excellent 26 oz. needle punch carpeting and cross link foam as our standard roll able floors. Available in your choice of royal blue or red. Two thick nesses (1.375" or 2" cross link) available. The flexible cheerleading mat: A mat to cheer about! SHIPS IN ONLY 1-2 WEEKS. Total: 6 ' x 42' x 1-3/8"
Total: 6 ' x 42' x 2"
Return sample for a full refund. PURCHASED SEPARATELY) must be installed before use. Both 40' x 40' and 42' x42' assembled floor meets FIG, USAG. MCAA and NFHS requirements for use in competition. Durable oil-tempered 2" x 4" spring with patented plastic retainer caps are resilient enough for gymnasts of all sizes and abilities. Retainer Caps and hardware included. Midwest Floor Springs, spring caps hardware $1.40 ea. E-mail us at sales@cartwheelfactory.com for a shipping quote. Mail the mat sample back for a full refund. CWF Flooring, Inc's. 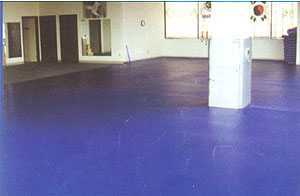 Martial Arts Floors- Seamless Flooring are a great investment; wherever practical, permanent flooring is the most economical martial arts surface available. Seamless Floors can be configured for virtually any application. CWF Flooring, Inc. 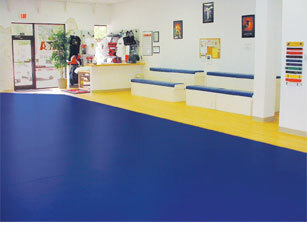 Martial Arts Seamless Flooring consists of 6 ft. wide rolls of cross linked polyethylene foam with a cover fabricated of extremely durable 18oz coated vinyl material (polyester scrim). For a more portable martial arts floor consider the interlocking mats. and will stand up to years of heavy use. excellent footing. Cross link also stubbornly resists degradation and breakdown. Min Order 300 Sq .ft. An economical way for your marital arts and gym flooring needs.